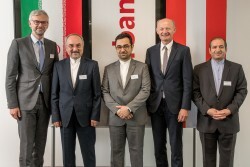 Only last year, the Upper Austrian Oberbank was the first European bank to sign a framework credit agreement with Iran. After the USA's withdrawal from the nuclear treaty, the bank is now under pressure and intends to wait and see. The bank says it could certainly take two weeks for a final solution to be found and officially agreed.